The kids have the day off school due to snow, but when you work from home you really have no excuse. So in an attempt to keep these high energy kiddies entertained I found this pattern for cardboard horses in an old Design Sponge post. They spent the next several hours tracing, cutting and painting while I should have been working, BUT instead I went to the blog that this was linked from and what I found was amazing! Ann Wood is an artist after my own heart. She makes creatures from little bits of disintegrating vintage garments, ethereal paper mache boats and cardboard castles. 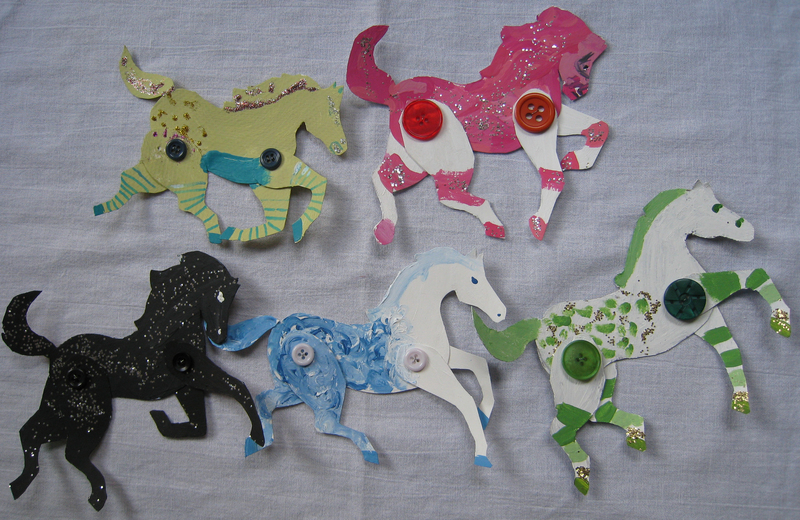 I spent most of the day enjoying her beautiful blog, while the kids made her stampede of horses. You can find her pattern here. Nice. My lil niece hasn’t shown much interest in being artsy or crafty (yet?). Too bad. She’s more of a performer. Btw, J. . .isn’t it 2012 now?